‘Now look at the black dot’. Suddenly I’m blinded by strip of blue light. It rotates a few times and a computer I can’t see makes a sound that clearly means ‘No’. ‘Hmmm, no. Let’s try again. Are you looking at the black dot?’ All I can see it blackness and a thin blue strip. I stop looking and admit defeat. ‘No, I can’t see it’. I mentally slap myself. I had so far managed to avoid making a fool of myself whilst talking to the pretty optometrist who was once again blinding me with the blue light. I’m sitting with a blanket over my head, my chin resting on a small platform and my forehead pushed against the machine that is currently mapping the shape of my cornea. I’m nearing the end of the many tests I need to have to determine whether I’m a good candidate for laser eye surgery, and if I am, their working out how much of my eye they need to ablate with a laser. From what I can work out, ablate seems to mean remove or stop something biological, and in my case this means vaporising my eyeball, well, 120(ish) micrometers of it. I’m surprised at how okay I am with this. I have only been considering laser eye surgery seriously for a week, ever since I spent the day with some friends, one of which had just had surgery. He had LASIK and he described to us what sounded like a horrendous surgery involving slicing eyeballs, pressure and a healthy dose of fear. I had just about convinced myself that I would never go near a laser eye clinic when he announced that, despite it being the worst two minutes of his life, it was totally worth it. ‘Hmm’. I thought to myself. The seed had been planted. I forgot about it until Monday. After work I was playing around on the iPad and decided to give it a Google. I was halfway through typing ‘laser eye surgery’ in the search bar when I decided not to do any research at all and just go for the consultation. Lots of people on the internet are there to complain about something, and who needs horror stories floating through their head when they’re on their back on an operating table, not me thanks. So here I am, moving my chin slightly to the left as the pretty optometrist, CY, zeroes in on the other eye. This time I stare at the black dot straight away (stupid dot). Another blast of blinding blue. I searched online for clinics in Seoul and I found reviews for a few, and an article from the Korean Times. The article from the KT was for a clinic in Gangnam, the biggest and busiest. The report made them sound fairly robot like once you hand them your money and the reviews for some suggested I take a Korean speaking friend along. ‘Dream Eye Center’ seemed like the best choice. It caters to foreigners and my lack of Korean shouldn’t be an issue. I sent them my details and got a call back the next day. I was booked in for Saturday, 2pm. I went out on Friday night and woke around 11am with a medium strength hangover and a very persistent phone telling me it was time to get moving. I jumped a train into Seoul and found the clinic in Myeongdong easily thanks to the directions they had emailed me. Before this test I had had about 20 others, according to the booklet they gave me I have a total of 24. After each test, CY explains the results and what they mean. Her English is perfectly understandable and she has answered all my questions well. 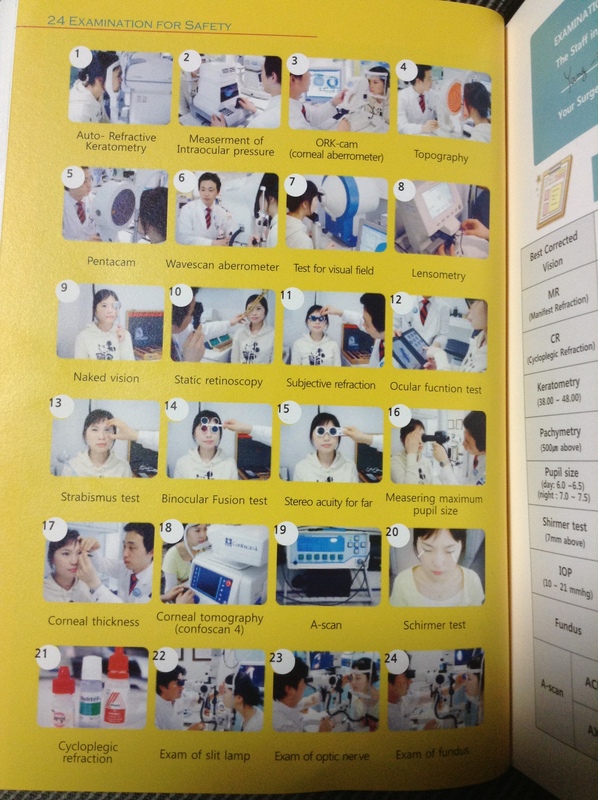 The first few tests were normal eye tests, like those you get when you go to the optician. These were followed by a range of different tests, each with its own machine. CY took photos of my retina (it’s beautiful), checked the health of my eyes (everything’s healthy) and measured the depths and thicknesses of different parts of my eye (all within normal limits). 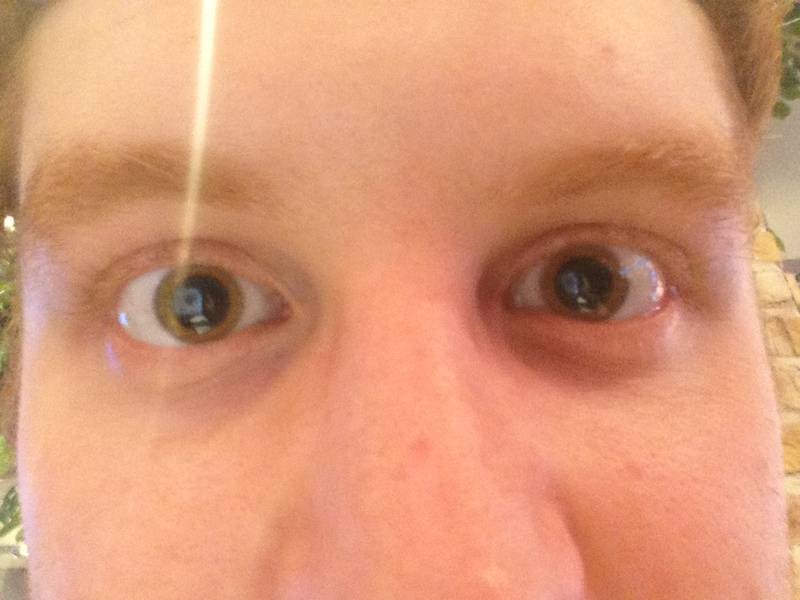 The only thing bad about my eyes is that they over-dilate in the dark, widening to 8mm’s rather than the average 7-7.5, so I’m at risk of having night glare after surgery. One test involved giving me a couple of eye drops, one to make my eyes relax and my pupil fully dilate, and another to numb my eyes. They were then poked with a couple of stylises (styli?) to measure more depths and thicknesses. I had a stupid grin on my face all the way through, CY even asked if I thought it was funny. I did, after all, it’s not every day your sitting in an eye clinic, in Korea, being poked in the eye by a pretty optometrist. The blue stops. The cover is taken off my head and I blink a few times. Only one more test and then I meet the doctor. I stuck my glasses back on and took a few steps towards the last machine. My glasses, however, had other plans. Choosing that moment to decide they don’t like my face anymore (they clearly know what laser eye surgery is and know the end is nigh), they come apart and fall to the ground, lenses flying in one direction, left arm in the other and the pin seems to evaporate into thin air. Super. First I can’t find the black dot and now I’m on all fours searching for a tiny screw, my glasses held to my face with one hand. I know I’m being watched by everyone in the room, I can feel it. The situation gets even more excruciating when not one, not two, but three of the optometrists start to help me look for it. I can’t take it, I try calling off the search, insist that it’s ok and I can easily find a new screw, but for one agonizing minute they search. CY finds it and smiles as she hands it back. I finish the last test, a game style test that checks field of sight to check for possible diseases, and sit down to wait and see the doctor. My iPad covers my face as it cools from Folly Red to a more acceptable Sunburn Pink. The doctor explained the options, as with the nurses his English was great and he could answer the few questions I had. 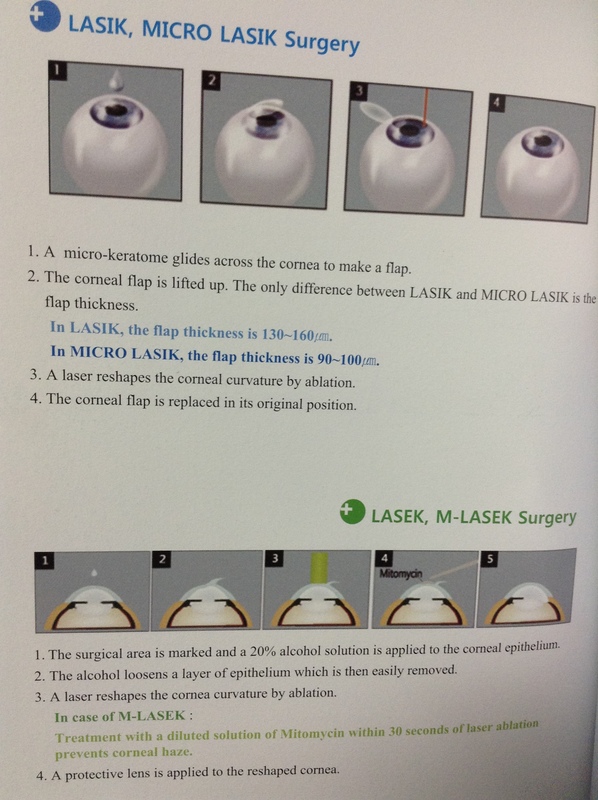 My eyes are suitable for both LASIK and LASEK. LASIK involves using a tiny blade cut past the layer of epithelium covering the cornea. They make a small flap and then do the laser eye surgery. This sounds bad but from everything I’ve heard it’s just uncomfortable as it involves some suction on the eyeball. LASIK is all over in a few minutes and the big plus is that recovery is quick, with improved sight after just a few minutes and little pain. Most people can go about their normal lives the next day. So far so good, however, the downside with LASIK is that, although the epithelium heals over it, the flap stays a flap forever. Anyone who is involved in contact or extreme sports is at risk of dislodging it if they get badly hit in the eye. I haven’t done much since I arrived in Korea but I enjoy a spot of kayaking and rock climbing and one day soon I want to learn how to jump out of a plane, so the doctor recommends LASEK. LASEK has the advantage of not having to make a flap, instead they thin the epithelium with alcohol, a laser or what was described as an electric toothbrush that grinds it down (no thanks on that last one). The downside of the surgery is that recovery is more painful and takes three or four days, as your epithelium needs to grow back. Recovery was described as having the feeling that you have something in your eye, but for three days. As I leave I pay a 100000Won (£60) deposit and book the surgery for a day I’m sure I can’t do. Finding a day I can do the surgery will be fun, it takes 3 days to recover and I can’t get a day off work. I only get 5 days holiday and I’d much rather spend it doing something fun. Lying in a dark room in pain for three days really isn’t my idea of fun, but we’ll see what happens. I say goodbye to the optometrists and other staff, turn around, and almost walk into the door. Great. 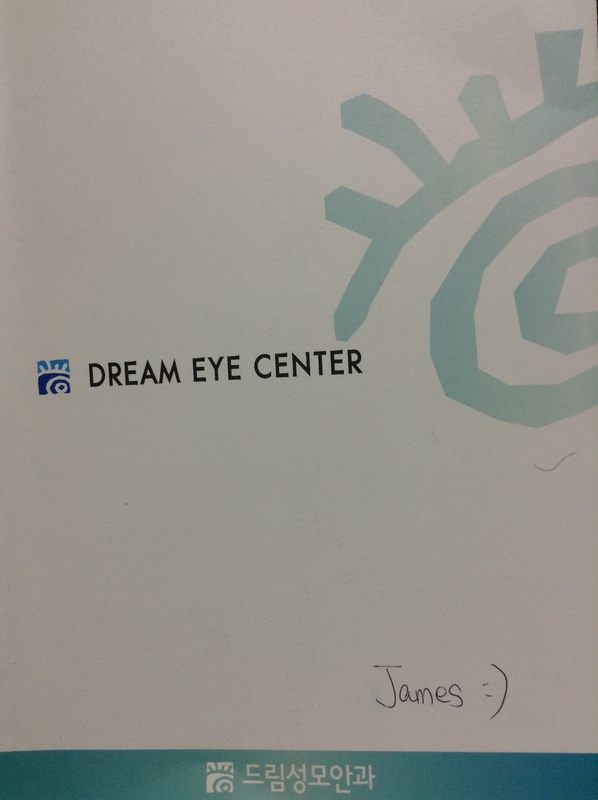 This entry was tagged Dream Eye Center, LASEK, laser eye surgery, LASIK, Seoul. Bookmark the permalink. Did you ever go and finish the laser surgery? Becouse Im in korea right now, and planing to go to the same clinic now on friday,would love to hear some more about your experiance and if your happy with the resulat? I’m almost one year to the day after my surgery and I am still amazed at just how good my sight is. As I’m traveling I can look around me and see details and distant objects that I wouldn’t have thought possible. The staff and service at Dream are great, but be aware that since my surgery I have been told of a few places that will do the surgery cheaper. I paid 1600000W for the surgery and some places will do it for as little as 1000000W. You can get discounts by publishing your experience online and also by quoting someone who recommended you, so if you mention my name they may make it a little cheaper. If you have any more questions feel free to message me. I consider the surgery one of the greatest decision I’ve ever made.